Step 1: Charge this pet nail grinder with USB for almost 5 hours, indicator light will be blinking while charging, light will be solid red after fully charged . Step 2: Choose the speed mode(low or high) accordingly, then choose a suitable port according to the pet's size and characteristics of their nails. Port 1 is suitable for small-sized pets; Port 2 is for large and medium-sized; Port 3 (its side) is suitable for grinding fast. Step 3: Holding the grinder with one of your hand, holding the pet pads with the other hand, put pets nail into a port gently, and then begin to grind. Please remember that for pet's safety, it should not be more than 5 seconds for one lasting time, and be aware to adjust the grooming angle to polish pet nails. Step 4: Take off the plastic cover the grinder in an anticlockwise direction, turn it on and gently clean the surface of the nail grinder with eraser, paper or cloth to remove the nail powder. Clipping your pet's nails can be a tense and sometimes painful experience for you and your pets. below are some instructions. First, show them the nail grinder and let them sniff it while it is turned off. Then turn it on so they can get used to the sound it makes. Next, have them sit down while the tool is running in your hand. Give them positive reinforcement. Finally, once they are used to the tool, try touching it to their nails. If they are not ready, you may need to repeat the above steps a few more times. ❤ SAFE & EFFECTIVE: Constructed with diamond bit grinder, which is safer and more effective than nail clipper to trim pet nails, reducing the risk of clipping the claws too short or hurt your pet. ❤ POWERFUL MOTER WITH 2 ADJUSTABLE SPEED: The nail grinder is powerful enough, there are 2 adjustable speed that you can choose acordingly, for large dogs, you'd better using "High" speed mode, while for small and medium-sized pets, just use" Low" speed. ❤ SUITABLE FOR ALL: Our dog nail grinder has three ports to meet your pets' demand, and you can set depending on your pet size, perfect for small, medium and large dogs, suitable for cats, birds, rabbits or other household pets. ❤ QUITE & PORTABLE: Designed with low noise motor, our dog nail grinder makes your pet trim without fear. You can turn it on and let your pet smell it and listen to the sound before grinding. Besides, it's portable, which is very convenient to use anywhere and anytime. BTW, please use 5V charger to charge the pet nail grinder. 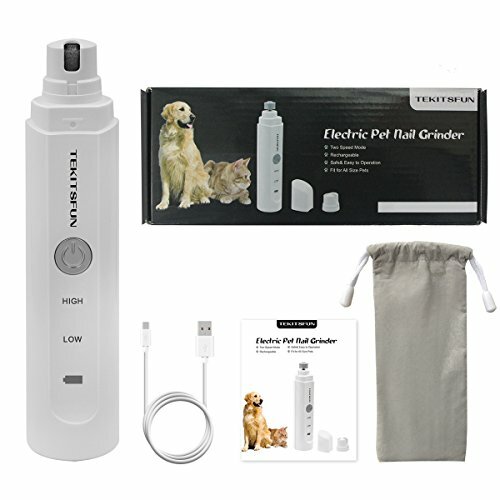 ❤ 100% SATISFACTION GUARANTEE: Charge the dog nail grinder with USB for almost 5 hours, indicator light will be blinking while charging, light will be solid red after fully charged,Each TEKITSFUN dog nail grinder provides 12 months warranty and 90-day 100% money back guarantee, any questions, feel free to contact us, our service team are here to help.